Tier 1 supplier Meritor Inc. posted lower net income and higher revenue in its fourth-quarter and fiscal-year periods as its markets improved, but separate financial issues cut earnings. Net income for the quarter ended Sept. 30 fell to $32 million, or 36 cents per diluted share, compared with $239 million, or $2.63. The contrast in net income primarily was due to a $243 million one-time gain on the sale of an equity method investment in the fourth quarter of fiscal 2017, and higher tax expense of $12 million as a result of the enactment of the Tax Cuts and Jobs Act, according to the Troy, Mich.-based company. A conversion on increased revenue and decreased interest expense partially offset the decrease. Quarterly revenue increased to $1.08 billion compared with $922 million a year earlier. Sales at its Commercial Truck & Trailer unit rose 18% to $854 million compared with a year earlier. The increase reflected higher production in all of the company’s major markets, increased market share and new business wins. The segment’s earnings before interest, taxes, depreciation and amortization climbed to $77 million compared with $6 million a year earlier — due to the favorable impact of changes to retiree medical benefits, partially offset by lower affiliate earnings and higher material and freight costs. In the electric vehicle space, Meritor reported it has 22 active programs across the globe on applications including school buses, yard tractors, medium-duty trucks, urban buses and refuse trucks — which are being supported with core Meritor content, including front and rear suspensions, wheel ends, drum and disc brakes, and gearboxes. Meritor also is offering its proprietary eAxle and other products as a result of the company’s strategic partnership with TransPower. The company is collaborating with customers including Daimler Trucks North America, Thomas Built Buses, Ashok Leyland, Kalmar and Peterbilt Motors Co.
For Peterbilt, a unit of Paccar Inc., Meritor will supply all-electric drivetrain systems for two vehicle platforms that will include 12 all-electric Class 8 day cab tractors and three refuse trucks. Its Aftermarket & Industrial segment notched sales of $266 million in the quarter, up 10% compared with a year earlier. The increase was driven by higher volumes in the company’s industrial business, as well as the business the company acquired in September 2017. The segment’s EBITDA was $39 million compared with $9 million a year earlier. 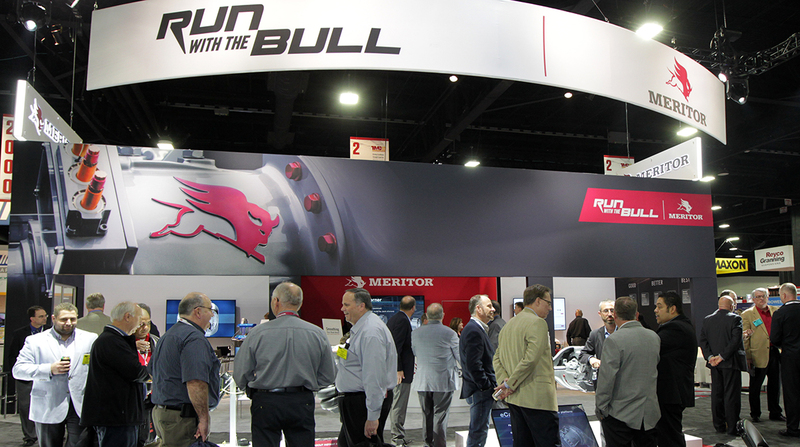 For the fiscal year, Meritor posted net income of $117 million, or $1.28, on revenue of $4.17 billion, compared with $324 million, or $3.59, on revenue of $3.34 billion a year earlier. The company forecast net income in 2019 of $230 million, or $2.60, on revenue of $4.25 billion. Meritor is a global supplier of drivetrain, mobility, braking and aftermarket products for the commercial vehicle and industrial markets.